The west end of Hickory Street, where the Albany leg of the Albany-Corvallis Bikeway is supposed to take off, roughly in the direction you are looking. The Albany leg would run for little more than a mile from the west end of Hickory Street in North Albany to where Scenic Drive ends on Highway 20, the Albany-Corvallis Highway. From Hickory, the path would cross vacant land, turn right at Walker Lane, then left and follow the Portland & Western track, until crossing the track just past Rainwater Lane, and follow West Thornton Lake Road to Scenic Drive. Construction of this leg is proposed in 2018 as part of ODOT’s Statewide Transportation Improvement Plan. The state plan lists the $2.7 million project as extending for 1.72 miles from Spring Hill Road to Scenic. But from Spring Hill along Hickory to the point where Hickory ends, the route already exists in the form of painted bike lanes. The Albany council’s agenda for Wednesday (Jan. 25) includes action on an agreement with Benton County, the lead agency in the long-planned bikeway project, on sharing expenses for the project. ODOT would pay more than $2 million. Albany would contribute $304,500 from its systems development fund for transportation, and Benton County would pay the rest, including $202,522 for property acquisition. Benton County is still trying to determine whether to even build the rest of the bikeway, and if so where it should go. Presumably, though, if the Albany segment is built as planned, the much longer Benton leg would have to start (or end) at Scenic and Highway 20. Make it so Albany! Wouldn’t it be great if you, I mean “we”, were the impetus for this project. Regardless of name. A nice feather in the cap I say. With the arrival of our newest White House occupant, there is much concern about his use of “alternative facts,” or lies as they are more typically referred to. The connection between the new president, falsehood and local political choices is real and Albany citizens must keep a watchful eye. It can happen here. 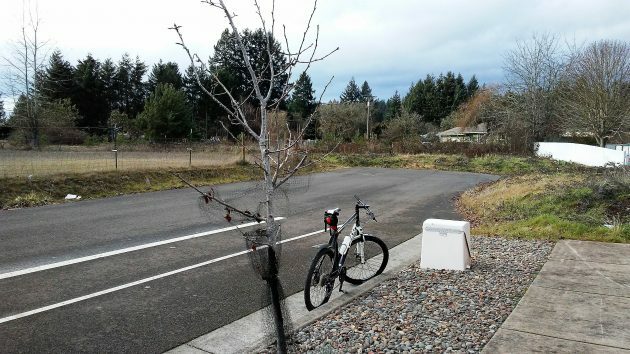 The truth is that somehow someone or many someones convinced Albany City Mothers and Fathers that a bicycle path between here and Corvallis is necessary and, further, we ought cough-up $2.5 million in taxpayer dollars so that a narrow, privileged sliver of society can “feel comfortable” about pedaling. In the meantime, motor vehicle operators are expected to continue to run the Highway 20 Gauntlet, risking their lives each time the journey is made. This begs the obvious question, one which Hasso does not wish you to contemplate because to do so might gore his oxen. Namely, why should bicyclists be given a safe and pleasant avenue to pedal on when the same consideration is not granted to those who pilot cars, trucks, buses and Peterbuilts. This is precisely the kind of social inequity that angered so many across our country, causing them to vote for a real estate salesman who spews falsehood each time he opens his mouth. Inevitably, Trump’s nonstop prevarication will lead to a trickle-down effect, causing local pols to employ alternative facts in defense of indefensible spending. Beware of the pedal-powered Trojan horse. The common man already knows that the “cycle privileged” is a group that oppresses us. Now we learn that millions of public dollars will be spent to benefit this elitist group? It’s a rigged system, man. Good to hear it is progressing. This portion of the path will be used heavily by the many walkers/runners in the area whether or not the full path ever gets built. The pathway in Albany shows it along Portland and Western Tracks. The railroad did not permit this elsewhere in Benton County, why would they allow it in the city limits of Albany? And if they don’t allow it, then the only way to put a bike path there is to take private property from homeowners via eminent domain. That also brought it to a stop elsewhere in Benton County. You really think the homeowners are not going to put up a fight in North Albany? $300,000 wont even cover the wetlands issues in North Albany. Let alone the studies and lawyers fees for eminent domain seizure. 2.5 million. ALBANY has so many deteriorated streets, Hill St, 38th St, how about all the sidewalks in West Albany that are unsafe for pedestrians. How about the people sleeping in Monteith Park or along the Dave Clark? Think we might have better place to spend money? I really can’t see good money being spent on something like this. There are many more worthy ways to spend these funds, or return them to the taxpayer. Count me opposed.